Sample this trio of decadent desserts. Indulgence. Let’s face it, the Turks & Caicos are the ideal scene to partake in pleasure. Warm, golden days on the beach. Sparkling turquoise seas at every turn. Gently caressing tradewinds making the temperature just right. So, whether you’re a visitor on vacation or a resident taking a well-deserved holiday break, why not take enjoyment one step further and savor a decadent dessert? There are many to choose from in the Islands’ huge selection of restaurants. Here are three of our favorites. 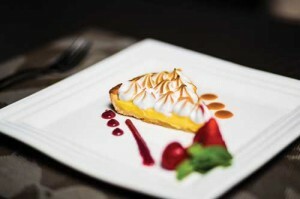 Parallel23, the fine dining restaurant at Regent Palms resort on Grace Bay, has always been the place to go for a special meal. The peak of culinary sophistication, the menu seeks to combine fare from each country along the 23rd parallel in unique and different ways, complementing each course with a selection from their extraordinary wine cellar. Parallel23’s loyal following of repeat diners will have their palettes refreshed this winter season. Patrice Borie, the resort’s new food and beverage manager, boasts a strong resumé of international experience, including six years in Morocco at the La Marmounia Palace and extensive training as a sommelier. Joining his team is Executive Chef Lauren Callighen (formerly head chef at The Somerset), with her own following of food “groupies” who admire her fresh, innovative cuisine. Added to the blend are Pastry Chef Sekar Wulandari Putri (from Amanyara) and a new wait staff of well-trained Thai servers and tastebuds are sure to tingle! You’ll find true Italian comfort food at Lupo, the casual, chic new eatery at Regent Village. Owner Mark Dillon brings tremendous restaurant experience from both his native Montreal and Provo’s Mediterranean restaurant Lemon. Mark says he loves the location of Lupo, with its airy indoor/outdoor seating that many find reminiscent of Miami’s South Beach. Lupo’s colorful collection of Italian fare is fresh, flavorful and value-priced, and you will soon be able to purchase deli meats, cheeses and other accompaniments for a beach picnic. 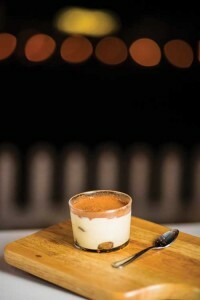 Mark says the majority of diners do order dessert, and Lupo’s version of tiramisu is always a favorite. Other “dolci” include panna cotta and pizzalla nutella, featuring the popular chocolate/hazelnut spread, crushed walnuts and lemon zest. Le Bouchon du Village is Regent Street’s own French bistro. Diners love to dawdle at the sidewalk café, savoring a cuisine and atmosphere that would be more at home in Paris. Julien Marziou literally grew up at Caicos Café, Provo’s first and favorite French restaurant, run by his parents, Pierrik and Daphne, where he said he absorbed the atmosphere “like a sponge” and is now taking the tradition to Le Bouchon. Dessert offerings range from Chocolate Marquise to Mousse au Chocolate and the Tarte au Citron shared here. 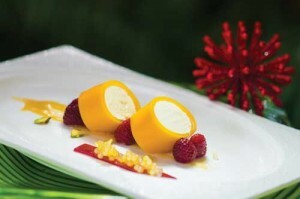 Ironically, the dessert was created by Cuban Chef Ruben Yera, who has played a role in the Marziou kitchens for over a decade.